Matthews reclaims Jamaica's National Crown! NM Shane Matthews has been a symbol of consistency over the years and has added to his résumé, a 6th Jamaican National title. Matthews exhibited professionalism throughout and coasted to a deserving victory. His second round win over Equitable Brown was a gem. This 34th Jamaican Championship was very interesting from the start as players jostled for positions on the Olympiad team. There was a bit of controversy and intrigue, but no story such as Warren Elliott's demolition last year. Matthews clinched the title by agreeing to a draw after Pitterson-Wheeler ended peacefully. 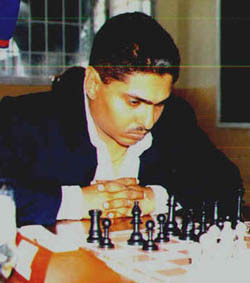 He finished with 6½ points and will be joined in the 36th Olympiad (Bled, Slovenia) by NM Jomo Pitterson, NM Duane Rowe, past champion FM Warren Elliott, FM Grantel Gibbs and Mark Smith. If one examines the parity of the field, it is logical to conclude that good things are ahead for Jamaican chess. Out of 18 players competing in the championship, an amazing 13 scored at least 50%! A notable performance was turned in by Malaku Lorne who starred in his first National Championship. He as well as Alain Morais provide a glimpse of Jamaica's future. "The Magician" will now lead Jamaica to the Olympiad where the island nation hopes to improve on their performance in the 2000 Olympiad. With the addition of FM Grantel Gibbs, the Jamaican side should improve measurably. Congratulations to the Jamaican Chess Federation (JCF) and to KRY$ FINANCIAL SOFTWARE for sponsoring a wonderful event!